Prep the tomatoes. Bring a medium-size pot of water to boiling over high heat. Drop the tomatoes into the water and cook for 1 minute. With a slotted spoon, transfer the tomatoes to a bowl of ice water to stop the cooking. Use a paring knife to peel the tomatoes; then core each one and squeeze out the seeds. Chop the tomatoes. Cook the ratatouille. Heat the oil in a large ovenproof sauté pan over medium heat. Stir in the onions and garlic, cook until shiny, about 2 minutes. Stir in the eggplant, cook for 3 minutes. Stir in the zucchini, yellow squash, peppers, and tomatoes; cook until they are shiny and slightly softened, about 3 to 5 minutes. Add the V-8 juice and thyme; bring the mixture to a simmer. Lower the heat to low; cover the pan and simmer until the mixture has thickened and the vegetables are cooked through, about30 minutes. Add the topping. Preheat the oven to broil. Stir the salt and pepper into the ratatouille; taste the mixture and add more seasoning if you wish. Sprinkle the cheese over the ratatouille and place the pan under the broiler until the cheese is melted and beginning to brown for 2-3minutes. 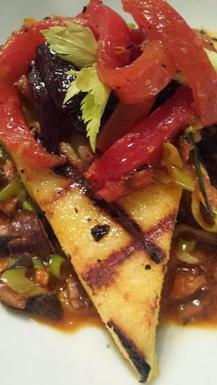 Top with grilled polenta (recipe follows) Serve immediately, family style. polenta is cooked and has a “porridge” consistency, approximately 15 minutes. polenta should not stick to grill before turning.